One Postcard a Day: Last in 2013 or First in 2014? 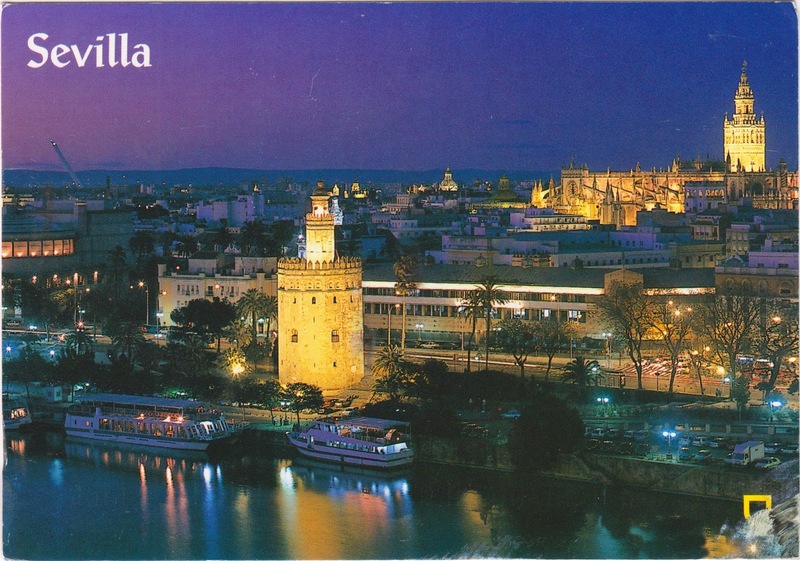 Postcard ES-215704 from Spain was the last official card I received in 2013. However, since the PostCrossing server resides in UTC/GMT zone, the registered arrival date was January 1, 2014. That would make this card my first in the New Year. The postcard shows a night view of Seville, the fourth-largest city in Spain, with the Torre del Oro (Gold Tower) at the left-center by the Guadalquivir River and the Cathedral of Saint Mary of the See at the top-right in the background. Built in the early 13th century, the Torre del Oro was a military watch tower that controlled access to Seville via the river. It got its name due to its golden shine projected on the river, caused by its building materials: a mixture of mortar, lime and pressed hay. It served as a prison during the Middle Ages. The Cathedral of Saint Mary of the See, known as Seville Cathedral, is a Roman Catholic cathedral that ranks as the largest Gothic cathedral and the third-largest church in the world. It was recognized as a World Heritage Site by UNESCO in 1987, along with the Alcázar palace complex and the General Archive of the Indies.